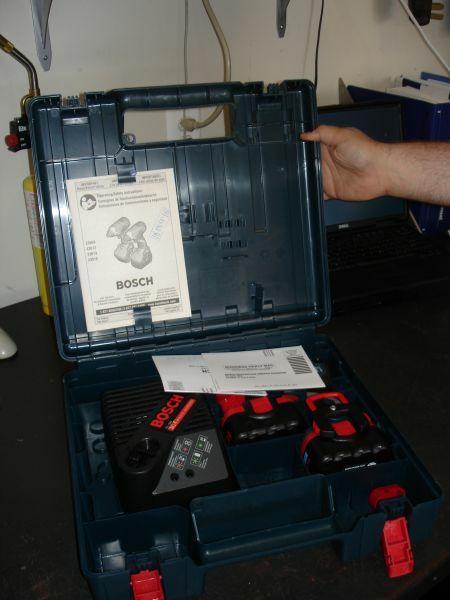 The 14.4V Impactor ships in a Bosch-blue hard case that’ll seem familiar to anyone who’s purchase a large Bosch power tool in the last few years. Inside you’ll find the tool, two batteries, a charger, and a manual. Looking at the tool itself, it’s easy to see the PS40’s heritage. The direction control and trigger are identical — selecting 0-2,800 RPM and 0-3,200 BPM — and while the exact pattern of composite and TPR varies a bit, it’s clearly designed to accomplish the same task. The shape of the tool just behind the chuck is identical. The chuck itself is also a 1/4″ quick-release type. A small clasp molded into the handle just above the battery holds a single driver bit (included — one side Phillips, one side slotted) for easy constant access. Also at the bottom of the handle, Bosch added a sliding “tool hook” to help you hang the 14.4V Impactor on a tool belt. The hook’s plastic cover also extends down to protect the battery’s latch mechanism. The batteries are 2.0 Ah, 14.4V, NiCds and are standard in the Bosch 14.4V line. Here’s a handy guide to show the differences in manufacturer’s specs for both tools before we get into the test itself. Read on to page three for our in-use experiences.